... and one giant leap on the journey home. Marie continues to do well but on Saturday the physiotherapists tried to get her walking but were unsuccessful. As you can imagine this left us a little deflated, but they don't give up so easily so on Sunday they returned with a better walking frame. One with wheels and aero bars. Success !!! Marie was able to walk from her chair out to the middle of the corridor and back, a distance of about forty feet. She was exhausted by the effort. I was worn out just watching. To say we were all pleased was an understatement. If there's so much improvement in one day, what might we be seeing by the end of the week. Latest news about coming home is "seven to ten days, assuming blood tests show the infection has gone". Marie has now had her operation and sends a big "Thank You" to everyone for their good wishes. The operation went well, and Marie is doing fine. She spent a night in the ICCU which was wonderful. One nurse per two patients and no waiting for anything. Then back to the ward the following afternoon. a lot of tubes and wires which will hopefully be coming out soon. Next on the agenda is a visit from the physiotherapist to see how much movement she currently has, and to see the best way to get mobile again. 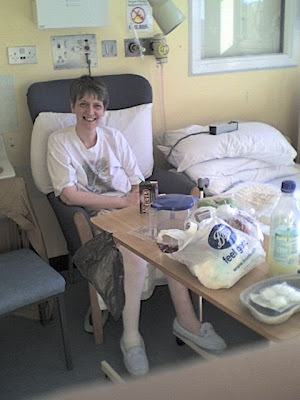 Then a visit from the dietician as the awful hospital food isn't great. Marie has been given a new bed. One with a firmer mattress so she can finally get some sleep. It's only taken a week for them to realise that the soft mattress had given her a displaced disc. Now that the bed is sorted, and the cold sore is under control Marie is feeling a lot happier. Operation has been rescheduled for Wednesday. Finally Marie says a big "thank-you" to everyone for their good wishes. Marie’s operation has been postponed through a mixture of bureaucracy and downright incompetence. Marie suffers from the occasional cold sore, especially is she is stressed, run down or in pain. As she is currently all three, it’s not surprising that the odd one will appear. Sometimes she gets them close to her eyes, which is rather serious as untreated they can lead to loss of sight. When this happens Marie goes to the Eye Infirmary A & E dept. and simply gives them her case number. They prescribe Zovirax eye cream and all is well. The whole process takes less than two hours and the end result is just a little darkening round the eyes. When you are in hospital that’s not the way it works. The cold sore was diagnosed straight away, and the staff even understood the importance of getting it seen to straight away. They accessed the records from the eye infirmary and ordered the correct medication from the pharmacy which was just one floor below. Nothing happened for almost thirty hours, so by the time the medication arrived Marie had an eye the size of a grapefruit with an enormous blister on the top lid. The surgeon can’t operate with it in such a state as there is too much risk of infection. It’s probably going to take at least a week to clear up. So as you can image we’re not happy bunnies. First of all, many thanks to all of you who sent us your good wishes, by whatever means. It is really appreciated. It looks like Marie is going to be in hospital for some time. The old hip joint has to come out and of course the area will have to be cleaned thoroughly as there is a lot of mess where it's been breaking up. I always thought titanium was a very inert metal but it appears not to be so. One of the doctors described it as a magnet for bacteria. To combat the infection Marie is having intravenous antibiotics, plus saline to re-hydrate her because the infection prevented her keeping anything on her stomach. The hip will come out and all being well, what the hospital call a temporary joint will go in, either on Tuesday or Thursday depending on when the parts arrive. Marie will be in hospital for about three more weeks and then there will be the recovery period at home. You can't bend your hip more then 45 degrees for six weeks. Neither can you drive or walk very far. By now you're probably wondering what I mean by a temporary joint. This one will be there until all the infection has gone, then in four to six months, it's back in again for the proper one. Knowing Marie, you can imagine that she isn't too pleased about being stuck in hospital for the next three or four weeks. On the plus side, she has a room to herself, with the luxury of her own bathroom. On the minus side, the food is terrible and the bed is very soft and as well as preventing sleep it's giving her terrible back pain. As well as her normal pain medication they are having to give her morphine for her back. However, all things considered she's in very goods spirits. All she needs now is a decent nights sleep. Marie is suffering from metal fatigue. Seriously. Regular readers will know that she has been suffering from a pressure sore for some time now. Everything was going very well until Thursday morning when I got a call at work to say her dressing had turned black and a smelly liquid was oozing out. Marie was also feeling sick and shivering and sweating. As she had an appointment with the practice nurse that day I left work and took her in. After a bit of prodding they summoned a doctor who told us to report to A & E at the hospital for blood tests and an x-ray. The doctor told us there was a possibility Marie may have to be admitted. Eventually, at 5 pm Marie was admitted to a ward and by 7 pm we found out that her artificial hip was suffering from metal fatigue and would need to be replaced. In the meantime it's antibiotics to control the infection and a good clean out of the wound. It would seem the black liquid was a reaction with the metal in the joint. So there we are. Poor Marie is laid up in hospital for a while. More news after visiting tonight.